Apart from your amazing puppy becoming a member of the Eden Orchards' family includes many wonderful features that you simply won't find elsewhere. Coat color and type are icing on the cake but truly the individual temperament of each puppy in the litter is the most important thing to consider when selecting your new best friend. I will carefully make recommendations and give detailed and thorough explanations to give you the best tools possible to select your perfect new family member. You are invited to come down for a play day appointment with your puppy around week 5. This gives you a chance to see your little sweetheart as well as take a tour of the property and meet the parents of the litter if you haven't already done so. We are very careful with the safety of our puppies and the possibility for disease transmission, but that is not an excuse to refuse personal, physical inspection of the environment your baby is raised in and the condition and health of the parent dogs. During the visit there is a beginning class on puppy training and socialization to start you on the right path to being prepared for puppy pickup in a few short weeks. 2) During the private Puppy Play Day visit you are encouraged to bring a pillowcase or old t-shirt that you and your family members have slept on. This fabric has your smells on them. 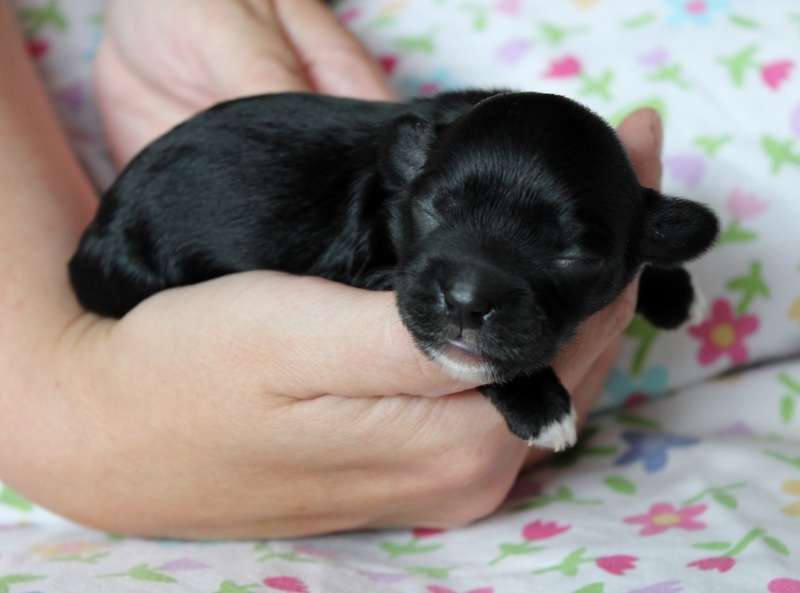 Every day each puppy is gently swaddled in the material and petted and cuddled and given several treats. Several times those final weeks the pup is given an opportunity to have Mama milk while laying on their new-people-smell material. These activities gives puppy a comforting and happy association with your smell. If you live too far away for a play day then you are especially encouraged to mail me a pillowcase so that when you meet your puppy for the first time it is like he/she has already met you and already feels comforted and relaxed snuggled in your arms. This time-consuming extra step for our puppies is taken to ensure our babies have the absolute smoothest transition to their new homes as possible. We want our baby to be your baby without any bumps along the way that could lead to long term behavioral issues that plague so many dogs today. 3) On puppy pick up day we are sure to feed your pup in the right timing for their trip home to reduce the incidence of any car sickness. That is also minimized by our early car ride experiences. We also ensure we time eating and potty-going so that your pup is least likely to become hungry or have any accidents for the first part of any long trip or the entire trip for locals. We pay a lot of attention to these kinds of details here. 4) Your puppy goes home with a 'new puppy folder' to keep your pup's health information together in one place. 5) Your puppy will be current on all his/her vaccinations-and they are vaccinated with only the highest quality premium vaccines that give the very best chances for disease protection and minimal side effects. 6) Your puppy will be current on all deworming/anti-puppy parasite treatments appropriate for you pup's age. 8) You will also get an adoption certificate that records your pup's sire and dam and date of adoption. When you pick your puppy up we will stamp that little paw into ink and press it on your pretty adoption certificate. Yes, it is cutesy, but so is your puppy. It is actually really fun to look back after the years go by and see that itty bitty footprint and think of how small your sweetheart was when you brought him/her home. We clip all the hair down on the pad of a forepaw the day before so we can get a good print. We want to be sure your puppy welcoming experience is a warm and cherished memory. 9) A small fleece puppy blanket. These blankets are rotated into the puppy nursery regularly and when they go home with one they will have all the scent of their mother and littermates on there. This can be very comforting for the puppy on the trip home as well as that first scary night away from Mom. Most breeders do not do this, and the few that do actually charge for the little blanket. We do not charge for this little extra because we know how much this little snuggle blanket can ease your puppy's transition and the health and happiness of our puppies always comes first. 10) A little stuffed toy. These toys are also rotated into the puppy nursery to be used during free play time and also cuddled with during naptime. We are careful not to get them soiled so they will be clean as well as retain the scent of the nursery and be just one more way for your new puppy to adjust to his new home as easily as possible. 12) A fully groomed puppy. Your little one will have a shampoo, conditioning and blow out treatment prior to going home. 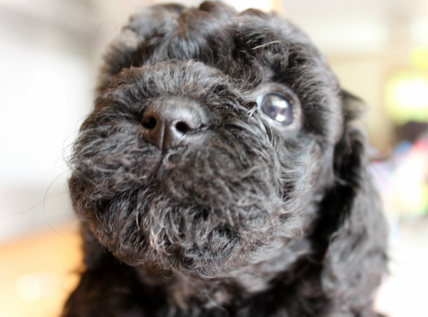 Those sharp little puppy nails will be clipped and moustache-faced dogs will have a hand-scissored and neat face to ensure a nice shape and growth pattern as well as clear sight (no hair obstructing vision). Your pup will have had his/her ears gently cleaned out with our Eden ear remedy wash and his little puppy teeth are wiped down with a washcloth. Your pup will be fresh and ready to give you lots of kisses! 13) An invitation to participate in Eden-families-only training seminars with special guest speakers/trainers (in the summertime) and/or puppy socialization classes as well as any reunions! 14) Permanent support from me, your breeder, for life. I am available for all your needs, questions, emergencies, training troubles or concerns and I am here to join you in rejoicing all your successes. And don't ever forget that I'm always thrilled to get updates and letters and news about your wonderful new companion. I never forget a puppy as each one leaves a little paw-print in my heart and knowing how happy your little love makes you and your family is important to me.